The group leader transports the kids around a course. The course is approx. 30m long and contains at least one obstacle (a little seesaw). 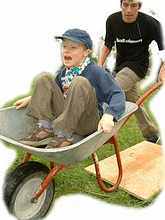 After each round the passengers in the wheelbarrow are swapped over. How many rounds will the group leader manage in 2 (3) minutes? It is heavy going after a while. The number of people who could be transported around the course in the given time (2-3 minutes) are counted up.